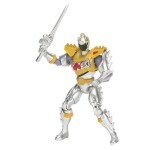 With thanks to both our friends at MorphinLegacy.com as well as our very own Kickback, we’re able to confirm that new Power Rangers Dino Supercharge figures have been spotted in the wild! Now showing up at Walmart stores are the Dino Drive Gold Ranger, Dino Drive Aqua Ranger, Dino Drive Purple Ranger, and Dino Drive Graphite Ranger figures. They are in a main aisle half-feature displayer with other Dino Drive figures and the elusive regular forms of Aqua Ranger and Purple Ranger. If your local Walmart store did NOT put out the side endcap displayer that contained the Dino Steel versions of the Power Rangers Dino Charge figures, there’s a good chance you’re getting this new Dino Drive displayer. These items so far have been found in Colorado Walmarts, both north and south of Denver, Colorado. Happy hunting! If you do happen to find new toys – let your fellow fans and collectors know! Post your findings in our Toy Sightings Forum, which is broken down by state and region so you don’t have to dig through a ton of posts. Good luck! The goodies keep on coming in with the upcoming toys for the recently released Power Rangers Dino Supercharge toy line, available now at all major retailers! Today, we have our first look at some of the soon-to-be-released 5″ figures – namely the Super Dino Drive variety! Basically being a re-release of the Dino Drive figures, but this time with added spikes on their arms and legs to make them “Super”, this new assortment will feature every single Power Ranger with the upgrade. For those who don’t watch the show – in recent years, if Saban Brands has elected to make their own cockpit for the Megazord battles, they also choose to go ahead and create their own “power up” forms inside the cockpit. We saw this originally with Mega Mode in Power Rangers Samurai, which followed with Shogun Mode as well. With Power Rangers Dino Charge, we’ve received it once with Dino Drive and we’ve already seen clips that show off this new Super Dino Drive mode as well. Oh hey – and we get our first look at the regular and “Super Dino Drive” modes for the Silver Ranger! 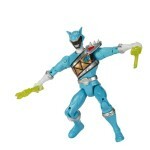 Special thanks to the folks at RangerCrew.com for the find on these exciting images! It’s finally here! 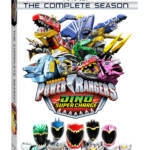 The season finale of Power Rangers Dino Charge has arrived! And the season ends with a bang – literally! But we’re not going to give away too many spoilers here on the front page. So what’s this episode all about? For starters – Sledge has the Purple Energem! And it’s going to take all seven of the Power Rangers to stop him! But just when our heroes are planning their attack strategy, they end up attacked and the unthinkable happens – Sledge gets his hands on a second Energem! Will the Power Rangers recover the stolen Energems? Will they finally be able to stop Sledge once and for all? And will that Purple Energem ever end up bonding to someone? All of those questions are answered in this, the season finale of Power Rangers Dino Charge! Check out some screen captures (from the international airing) in the news story – then click on the ”Discuss on TokuNation forums” link to vote on the episode and share your thoughts! You don’t need to be registered to take part in our polls! So what did you think? Join in and sound off! The toys are already hitting the shelves in Toys’R’Us and Target stores, but the elusive 5″ figures for the upcoming Power Rangers Dino Supercharge toy line have yet to be spotted in a major retail outlet. But now, thanks to some sleuthing by @razzle1337 on Twitter, we have four official images for four of the upcoming figures. Check out official images for Dino Drive Purple Ranger, Dino Drive Gold Ranger, Dino Drive Graphite Ranger, and the incredibly anticipated Aqua Ranger! And don’t forget – if you do spot new toys, remember to share them in our Toy Sightings forum, which is broken down under all 50 states as well as Canada and the UK! UPDATE! 8 more images added to the story!